Consider traditional fixed and new flexible automation systems to achieve reliable, safe, and profitable production of medical devices. Used in both fixed and flexible automation systems, rotary indexers move in a circle as predetermined movements and tasks are completed. No manufacturer has a greater responsibility than those who create medical devices for protecting the health and well-being of its customers. If not manufactured properly, these devices can cause harm or death, so designers and manufacturers must take great care that their end products meet the highest quality standards. One area of consideration is optimizing process control capabilities. A fixed automation technology to accomplish this revolves around the operation of the fixed-stop index cam for manufacturing, assembly, and packaging of medical devices. However, automation advancements have evolved to include flexible systems with a constant-lead cam as their means of controlling the motion. If an indexing operation calls for the cam to rotate 90° and stop, it’s cut so those operational parameters are always achieved, with no change in or added movement allowed. By comparison, the index characteristics of the constant-lead cam are not determined by the way the cam has been cut, but rather electronically by a programmable device — usually a servo-motor — instead of having the indexing and dwell times built into the cam. Constant-lead cams have a programmable indexing period, but no true dwell period since the servomotor is designed to continually use infinitesimal movements con-trolled by thousands of encoder points on the motor to seek correct position, even when the cam has stopped. The subtle differences in fixed-stop and constant-lead cams need to be considered when deciding which technology to deploy. Both fixed and flexible automation systems have their own specific pros and cons regarding their applicability in a specific manufacturing process. Automation systems are typically available in two configurations: rotary indexers that move in a circle as predetermined movements and tasks are completed, or conveyor systems that move parts or products in a straight line through production. Rotary and linear systems can be outfitted with either fixed or flexible automation systems, and specific considerations must be weighed before choosing fixed or flexible automation for each. 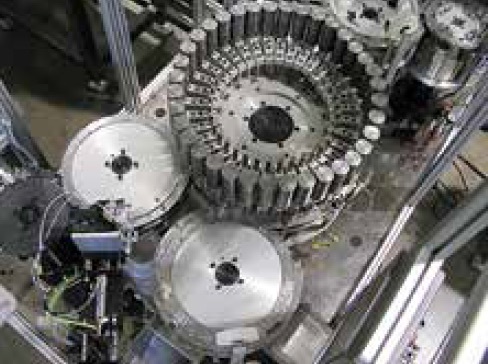 A typical rotary indexing system can feature a six-position dial plate, where the first one loads the product, the second performs gluing, the third performs welding, the fourth drills a hole, the fifth inspects the product, and the sixth off-loads the product. Traditionally the sweet spot for fixed automation, these systems can be modified to feature programmable movement through a servomotor, making them a choice for operations where a flexible system can perform well. For involved processes, the linear conveyor system has typically been the first choice. Technology advances now enable movement of the conveyor by traditional fixed cams or servomotors, allowing use of both automation technologies together for operations requiring a part to be moved 6" one day, and 12" the next day. Introducing flexible systems into the operation of linear conveyors also forces the operator to consider whether the production process needs to be synchronous or asynchronous. A linear system with synchronous movement — which can employ either a fixed or flexible automation system — may have 10 processes, nine of which take 4 seconds to complete before a final 20-second inspection process. In a fixed system, the inspection process would be conducted on a one-by-one basis, with subsequent parts waiting in line. With asynchronous movement, three or four finished parts can move into the test bay at the same time for simultaneous testing. Asynchronous movement — featuring fixed or flexible automation — allows more products to be completed faster with one machine rather than four chain-link conveyors. Asynchronous movement is accomplished by magnetic conveyor systems to accurately control movement. 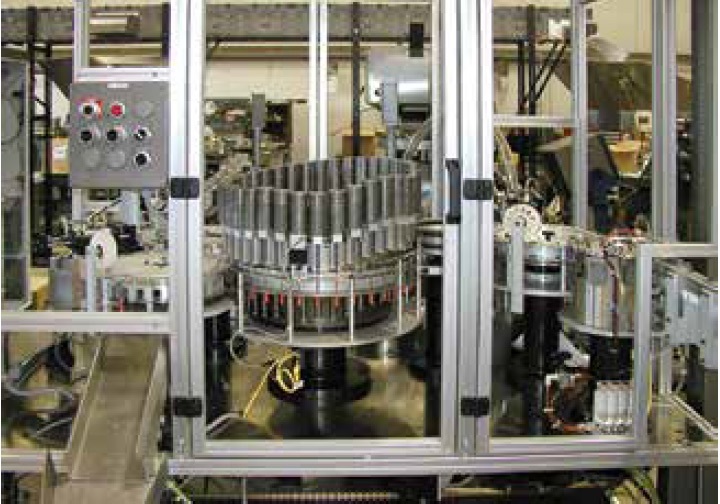 Benefits of magnetic systems — either synchronous or asynchronous automation — are faster line speeds, more predictive, less frequent maintenance required, significantly smaller size than traditional chain-link conveyors, process programmability, and push-button changeover capabilities that eliminate the need for change parts. Will there be stations that have different processing times on the same equipment? If so, operators will have to decide if changing to an asynchronous-movement system is best for their operation. Will there be more than one type of part processed that requires different motion parameters? This sounds like a motor process. In the future, is there a likelihood of processing different parts on the same machine? Fixed is the way to go if the machine will only make one part; if the project’s parameters will be changed at some point, flexible is probably the better choice. Does the part need to be rigidly held or locked in place during processing? Fixed is the best choice if the part needs to be locked firm; consider a flexible system if the servomotor is outfitted with a braking system. Will there be any large, unbalanced gravity loads while in the dwell period? Choose a fixed system for handling these heavier loads as operation of servomotors can be affected by imbalanced loads. Does the process require displacement, velocity, or acceleration feedback during movement? A flexible-based system is the best choice if accumulation of feedback by a central controller is needed. Is there value in being able to precisely control/restrict movement while in the dwell period of the cam? With fixed systems, the dwell period has no chance for ancillary movement. However, some operations may require times when the dwell time must speed up or slow down, making a flexible system the better choice. Will there be technical support available in the field to program, re-program, adjust, and trouble-shoot if a servomotor controls the system? Without technical support readily available, a fixed mechanical system is the better option. There will be more questions to consider since every manufacturing operation is unique, as are its operational parameters. However, either the tried-and-true fixed system or a new flexible system will meet the needs of the operation if careful consideration has preceded the ultimate decision. About the authors: Tom Bemer, Destaco product applications manager, can be reached at tbemer@destaco.com or 847.612.9456. Ray Tynczuk, Destaco application engineer, can be reached at 847.215.5670. Fixed-stop automation systems let the user know that each movement in the production chain will be performed identically every time, while flexible systems allow for different dwell and indexing times to be used.